I am pretty sure they would as they know a lot of people would try one if the body plastics were changed. Just wanted to give my thoughts on this device after owning and using it daily for the past year. While the vape still works wonderfully, it is basically falling apart. The USB port no longer works (I've had the same problem on both my first and second units). Thankfully this isn't a problem as I have an external 18650 charger. Along with that there's the usual cracking above the battery compartment, as well as around the bowl area. The mouthpiece barely even attaches anymore. 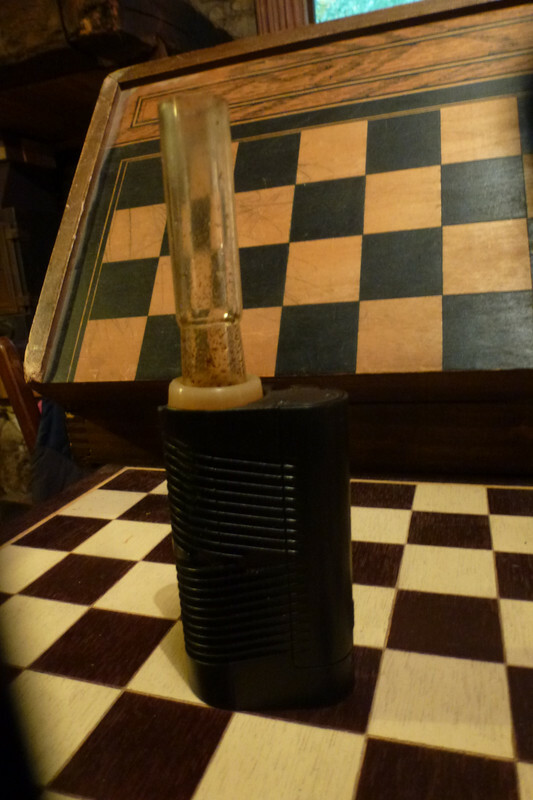 Again, the vape still works great, and I do still use it everyday. I just wish it were a little more sturdy. I'm not sure if I would buy it again though. My Alternate is still on rotation despite I can't use anymore the included mp(V3) and the Crafty one. I use a short 14mm female glass tube as a mp. I stuck the bottom part of a S&B dosing capsule in the 14mm female glass joint and help to keep everything in place on the top of the Alternate's bowl using a Quartz Quest large silicon band. It's not a good mod for on the go use but, at home, this is works perfectly although you have to handle it carefully cause it's only kept in place cause the silicon band slip on the edge of the bowl by 1mm or a bit more. This band is out of the vaporpath. BigJr48 and PPN like this. ?? single use...? is it true?! I'll try but the dosing caps is nice cause it helps to keep the load fairly compressed. Idk if I can with a basket screen but I'll try! That is why they have 400 unit bags of them for sale, I reuse mine over and over though, the main reason I would swap in your case is better airflow and less particles in the stem! hat is why they have 400 unit bags of them for sale, I reuse mine over and over though, the main reason I would swap in your case is better airflow and less particles in the stem! I disagree, the caps can be used over and over, but once they get seriously bent they don't seem "fixable". Just like there are folks here who don't save AVB and resin from stems, there are folks here that will get 40 capsules to last years and others will toss them after a single use. FYI, I am thinking about purchasing the S & B capsule kit. I would buy an extra set of 40, but not to toss the first ones. I remember as a kid the comment about someone buying a new car because the ashtray was full. Everyone is different and has different priorities. Irish vaper, LesPlenty and BigJr48 like this. Everyone is different, I agree, but our priorities must to be the same if we want to continue to live together on this too tiny planet lost through biliions of billions of others planets in the Universe! You disagree, I said I use mine over and over, a set of 9 has lasted me over a year, it is S&B that says single use, not me. Either way, get rid of it and change to a top hat for better airflow. Just wanted to say I've been loving the alternate still. I can hand it to any one of my smoking friends and get them absolutely baked in like 2 hits. They all want a vape now. LambsBreath, Peacer666, BigJr48 and 1 other person like this. Thanks to @Vivant for not replacing my alternate top cap. Sent a lot of emails for the last 6 months and never replied. I will never buy from vivant. sickmanfraud and LesPlenty like this. @AlanKeni What email did you use? Please make sure to send it to info@vivant.com. I've been considering getting a Crafty when I stumbled upon the Alternate tonight (it was mentioned in a different thread here) Being totally intrigued I read most of this thread... and just ordered one from heavengifts, also ordering a Crafty CU, only $77 for everything! One thing that really got my attention is the adjustable airflow control and reports of free-flowing draw resistance. Price alert for anyone looking: Right now at heavengifts the Alternate is $53.20 plus shipping ($62.50 shipped to USA) with the 30% off "Early Spring Sale" promotion that's currently on. I inquired and they checked with factory, it is the newest version. (although it's the "without battery" version) But no way could I resist for that price, especially after reading comments like Cheesequake's! TBH @Cheesequake, I bought it immediately after reading your post! Thanks for the nudge! I still use my Alternative (with it's original top piece (even though I have the next 2 versions) on a 2-3 time a week basis. I still feel like this is a very good convection tool. The thread deserves to see more activity. LesPlenty, LambsBreath, PPN and 1 other person like this. Yes, I'm still using mine too, this is the best vape from Vivant! LesPlenty, Vitolo and LambsBreath like this. This is great to hear! Gives me even more confidence. Especially looking at all the other vapes the two of you own! I'm stoked about getting this, and I'm surprised it wasn't suggested previously in another thread where I mentioned the idea of looking for a used Crafty to mod. I plan to use the OEM top cap for a while too, but will probably fit the Crafty CU before very long, I enjoy modding/improving things and at this price I won't have second thoughts, yeah this will scratch my itch to mod a Crafty, and it's already upgraded. LesPlenty, BigJr48 and Vitolo like this. I’ve just about given up on my Alternate. After RMA-ing several of them, I’ve decided it’s just not suitable for a daily driver and that only gets worse if you try to do anything remotely athletic with it. The last one they sent me I only use once a week, and never above 375°F. Great hitter though. Awesome convection airflow. 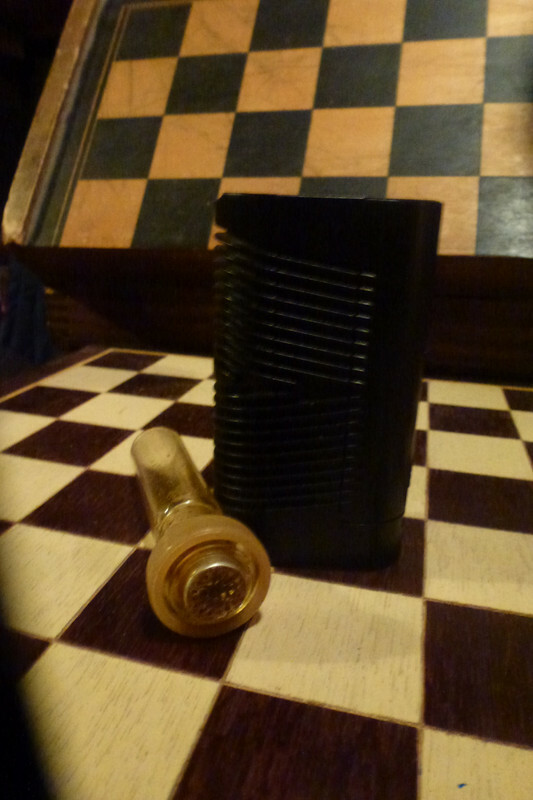 Edit: I also want to mention I’ve had great customer service from Vivant. Every RMA was done over email and completed in about two weeks. The feedback on this is all over the board! I've been reading the long evolution of problems so I can understand, sorry it didn't work out for you. Good to hear it performs though... and about Vivant's customer service! What was the issue with the last one they sent you, and how recently did you get it? I haven’t broke the last one yet. I have upgraded to a Davinci IQ and concentrate cartridges. I burn it every other week or so, but never over 375. If you’re just using it by yourself for one to three bowls, it does rip good hits. In a power session, of say 2-3 batteries worth of reloads, I think it’s not up to the task. I find the IQ makes a much better daily driver. LambsBreath, LesPlenty and BigJr48 like this. Got my Alternate a few weeks back and unfortunately it's been a roller coaster ride of robofart/melting plastic odor and less than satisfactory customer service. I had anticipated a good experience with this because of the positive feedback here, but I guess bad luck prevailed. The odor was coming from the bowl/heater, not the mouthpiece, it was still present after about 10 empty full temp burn-offs a a full bowl or two. I emailed for warranty service and paid to ship it back to Vivant, then someone in the warehouse made a mistake and sent me only the bottom part for replacement, which also had robofart odor still after 7 burn-offs. I emailed again about the replacement missing the top and also having the odor and questioned why both units had the odor to begin with. Well today I got a response saying they are sending back my original unit because they checked it and found nothing wrong: "finding no defect or risk of toxic off gassing on the original unit"
And absolutely not a word to answer my questions about the smell, I also asked if burn-offs were required and they didn't answer that either. They sent a return label for me to send back the bottom part they sent. I guess the robofart/melting plastic smell (that still persisted after 12 burn-offs) was just my imagination! So now what?? What am I suppose to do with this thing when I get it back? I slightly recall someone posting theirs had a smell and it goes away after about a month... but how can you inhale those fumes for a month? I tried a couple bowls just with mouth hits (not inhaling) and yuck, the taste was disgusting! But I just want this to work! Seems like a great unit, if only it didn't have that odor/taste! @Vivant can you please help or advise? Where did you buy your Alternate from? sickmanfraud, LesPlenty and BigJr48 like this. Well I received my Alternate back today from Vivant and whaddayaknow...the odor that was present before is all but gone! I did 2 burn offs and 2 bowls and the second bowl had excellent flavor right from the first draw! Not sure why the odor is gone, wondering if Vivant did some more burn-offs or something else. Or maybe just because it's been sitting out for weeks? Anyhow I was surprised and delighted, I fully anticipated getting my unit back with the same robo-fart it had when I sent it! Plus it's performing well too so far - at 370 degrees the Alternate has very good flavor and vapor production, and pretty pretty much a full even extraction. So at the end of the day (in hindsight) Vivant's customer service wasn't so bad at all... to their credit the replacement unit was sent out as soon as they saw the return receipt for the bad one, they don't even make you wait until they get the defective one back. And as soon as they found out the replacement unit had an odor, and they checked my 1st one out, they sent a return label for the replacement and immediately sent my 1st unit back to me, both times shipping took only a few days. There were a few other issues but they ended up taking care of everything quickly. I'll reply here again with further feedback on it after using the Alternate a while longer! E0x, LesPlenty and BigJr48 like this. Is there a way to set/reprogram to extend the shut-off timer? 60 seconds is a bit too short. I watched a video on eleaf.com that showed holding the + and Power buttons simultaneously to enter programming for the timer (adjustable up to 5 min.) And something mentioned about a "firmware update"
However I cannot get mine to enter into the timer setup, holding those buttons does nothing. Now I have the longer session timeout and can adjust temps on the fly during a session, both oft these upgrades have made using the Alternate a far better experience for me. Both Alternate's I got came with version 1 (v1.01) firmware. (the one from heavens gifts and the warranty replacement unit that I got directly from Vivant) No idea why, but apparently new Alternate's do not come with the latest firmware installed. LesPlenty, BigJr48 and E0x like this.